Football season and January Whole30 have me amped up every Saturday, planning and dreaming and Pinterest-ing how I’m going to Whole30-fy all sorts of fun game-day snacks. It’s definitely a lot of fun to think about healthier ways to enjoy the game, but with the Superbowl coming up soon, I’m kind of looking forward to one last fun Sunday in front of the TV, then a break from it all! Because as much as I enjoy it, I’m equally cool with leftovers and a nap on Sunday afternoons. We’re Buffalo Bills fans too, so it’s not like we end up with many wins either. You know what I mean, right? 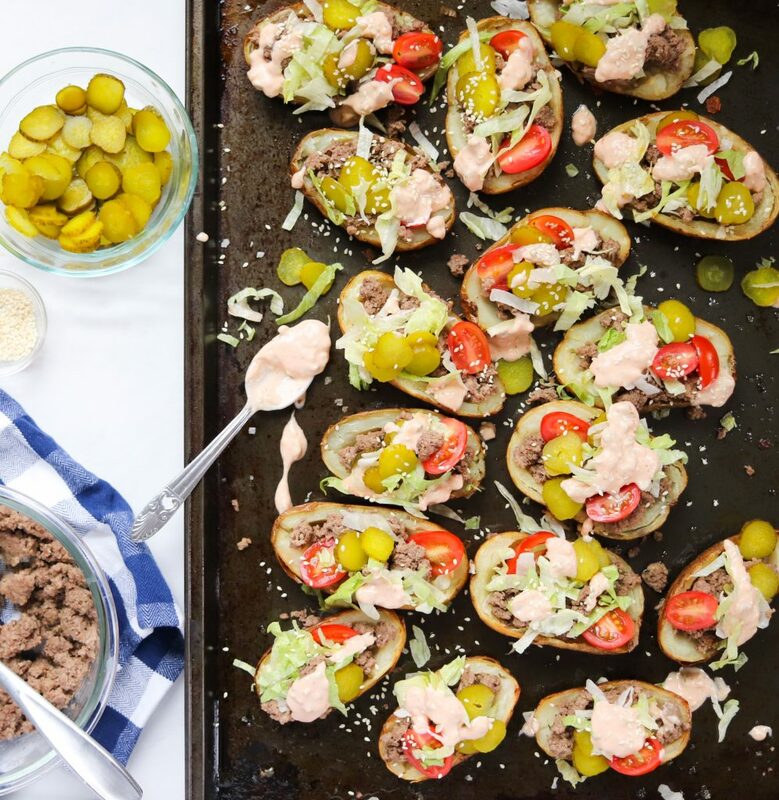 Well here’s one snack you’re definitely going to want to make for the Superbowl – Whole30 Big Mac Potato Skins, complete with “Special Sauce” and everything. They were by far my favorite Whole30 meal this January. 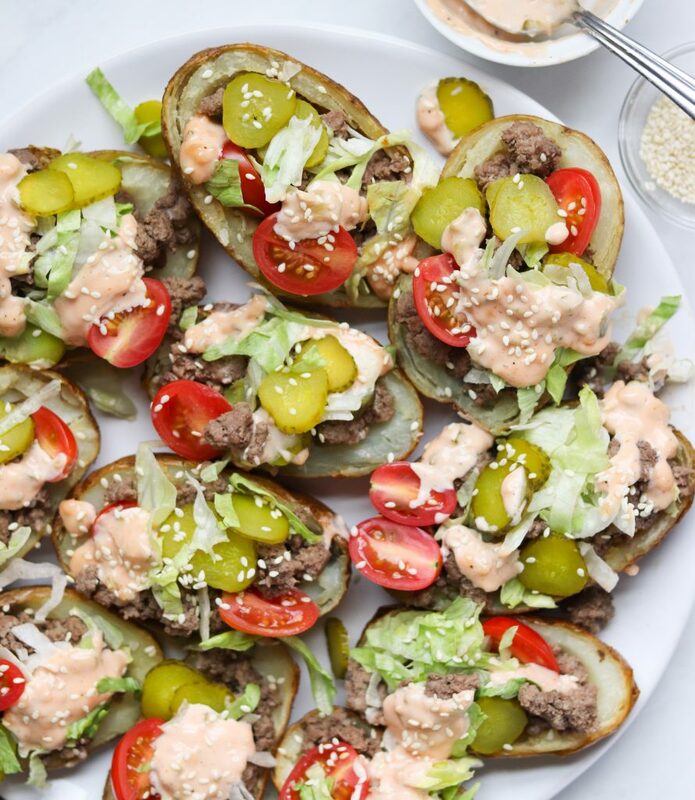 I told my kids why I was calling them Big Mac Potato Skins, because they’ve got all the things we love about McDonald’s… “Two all beef patties, special sauce, lettuce, cheese, pickles, onions on a sesame seed bun!” Can you believe they insisted I change the name to Happy Meal Potato Skins after they heard that? Where’s the toy, kids? 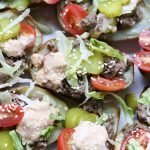 But whatever we’re calling them, I took all the best parts of the Big Mac and cleaned them up to a Whole30 and Paleo snack, using grass fed ground beef, a homemade special sauce, pickles, lettuce, tomatoes and sesame seeds. The sesame seeds are key here, folks. They really make it “feel” like a Big Mac. Don’t skip the sesame seeds! And the crispy potato skins give you all the happiness of the fries that inevitably come on the side of your Big Mac. And side note: If you ever need to make the perfect baked potato, just follow my instructions below. Baked potatoes should be crispy on the outside and soft and fluffy on the inside, and my way is totally fool-proof. No wrapping in tin foil necessary! If you drizzle the skins with extra virgin olive oil and sprinkle them flakey sea salt before you bake them, they’ll be absolutely perfect. I used my baked potatoes, then scooped out the insides with a spoon to make these ultra-crispy Whole30 potato skins. The one thing I did decide to omit here was the chopped onions that normally come on a Big Mac. Because in my family, the kids just don’t eat onions. Even if I chop them into microscopic sized pieces, they’ll still somehow identify them and spend the entire evening picking out every single piece of raw onion. It’s just not worth it for me! Feel free to add it in, though, of course! 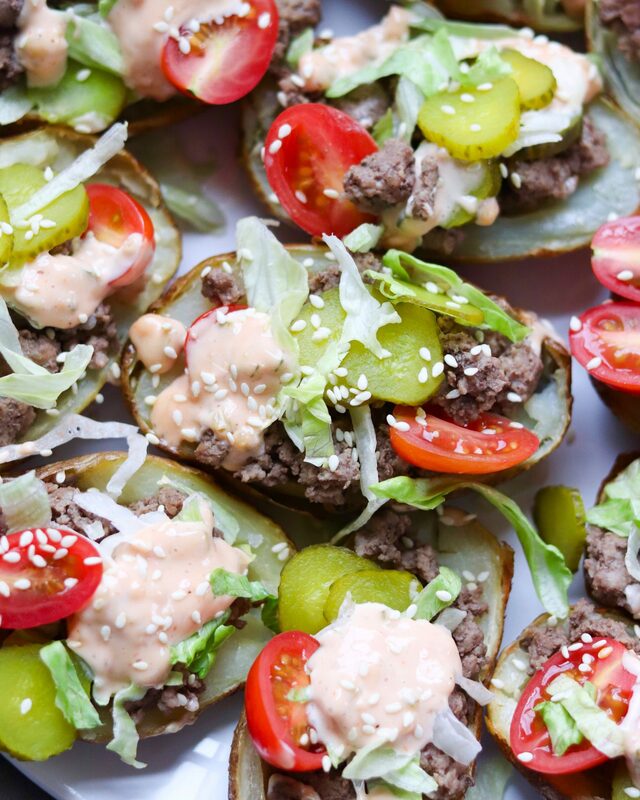 For Superbowl Sunday, these Whole30 Big Mac Potato Skins are definitely going down. I’ll also be making some other healthy game day snacks — Check out my Instant Pot Buffalo Chicken Nachos or Whole30 BBQ Chicken & Ranch Sliders if you’re looking for more ideas!! Preheat your oven to 400. Wash and dry the potatoes and pierce the skins of each potato a few times with a fork. Lay the potatoes on a baking sheet. Drizzle each with olive oil and sprinkle sea salt. Bake for 45-55 minutes. The skin should be nice and crispy and the inside soft enough to pierce with a fork. Remove from the oven and allow them to cool until they’re not too hot to handle. Don’t turn the oven off. While the potatoes cook, mix all the ingredients together for the special sauce. Cover and refrigerate until you’re ready to use it. Brown the ground beef in a skillet over medium heat, breaking apart and turning often as it cooks. Season with garlic and onion powder and sauté until cooked through. Shred the lettuce. Slice the tomatoes and pickles. Cut the potatoes in half longways. Using a spoon, remove most of the insides and set in a bowl to use another time. Place skin side down back on the baking sheet and bake for about 8-10 more minutes, until they’re nice and crispy. 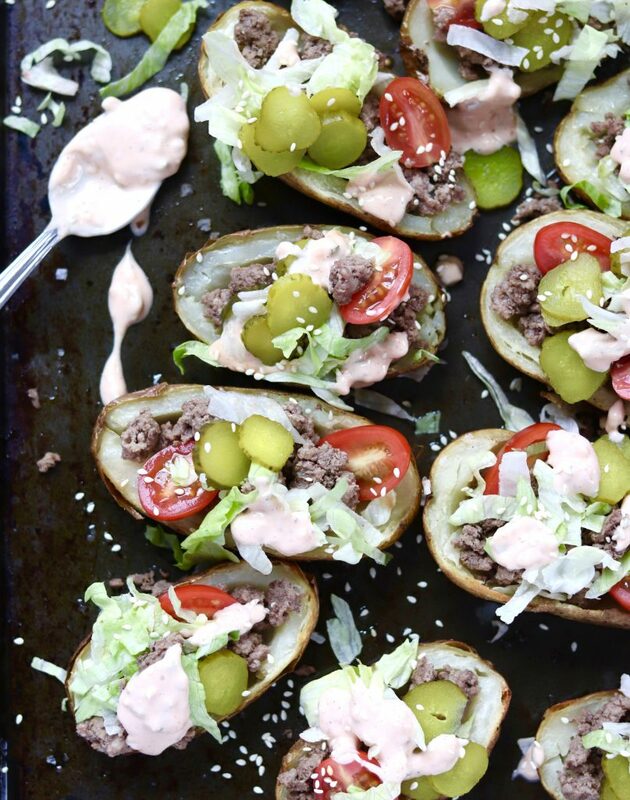 Fill each potato skin with ground beef, pickles, tomatoes, special sauce and sesame seeds. Are you going to make these? I’d love to see! 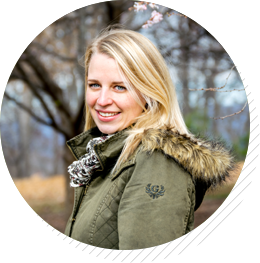 Be sure to tag me on Instagram @cookathomemom! I’ll occasionally indulge in a Big Mac here and there when traveling for work and after having these, I can tell you that I didn’t miss the bun one bit. The special sauce was banging! SO GOOOOOODDDDDDD!!!!! I can’t wait to try this for Super Bowl! Looks amazing! So glad! Hope you love it! What a great idea! These are actually making my mouth water! Thanks for the awesome inspiration. Thanks so much! A crowd pleaser for sure. So happy I stumbled across this blog on IG. All the recipes looks amazing!